Drum storage containers by US Chemical Storage. 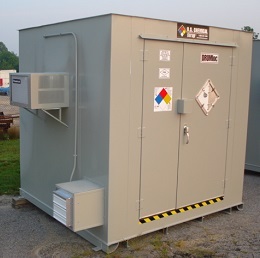 Fully customizable and 100% compliant for storing hazardous chemicals safely. Safely store bulk chemical drum storage to keep your investments and personnel protected. Storing hazmat drums inside proper chemical storage containers offers greater convenience and increased efficiencies to enhance your manufacturing processes. Drum storage containers by US Chemical Storage are manufactured to be non-fire rated, although 2 and 4-hour fire-rated constructions are available for storing flammables and combustibles. 2-Hour Fire-Rated Construction: Allows you to store your flammable drums inside your chemical storage building 10-30 feet away from occupied facilities or property lines. 4-Hour Fire-Rated Construction: Store flammable or combustible drums inside your chemical storage building less than 10 feet or within occupied facilities. Look for labels on drums such as symbols, words or other markings that indicate hazardous contents (ie. explosive, toxic, flammable, corrosive). Check for signs of deterioration, including rust, leaks, or corrosion. Before moving drums, be sure to check the drum is not under pressure (swelling or bulging indicates pressure is present). Do not move drums that are under internal pressure. Ensure bungs and any other openings are sealed properly. Rid toxic fumes from drum storage containers by turning on the exhaust fan before entering. Store chemical drums in a temperature controlled environment to prevent chemicals from becoming unstable. Unstable chemical drums can explode and/or catch fire, causing serious accidents. Warmer geographical areas are highly advised to maintain drum storage containers at a temperature controlled environment to prevent chemical explosions. The DRUMloc™ chemical storage building by US chemical Storage is designed to compliantly store 55 gallon chemical drums; including flammable and non-flammable drum storage. Engineered from heavy-gauge steel and hand-welded by our certified welders to provide a strong and dependable structure for a longer lifespan. Customize drum storage containers to meet exact specifications for your unique project. Customizable lengths, widths and safety accessories are available including standard doors, roll-up doors, gas detectors, alarms, liquid level sensors, mechanical ventilation, passive ventilation, shelving, racks and more. Perfect for mixing and dispensing flammable liquids or other hazardous materials. Meets EPA, OSHA, NFPA, IBC, IFC regulations and FM approvals or Warnock Hersey standards. Featured with a 15-year structural warranty, built-in secondary sump containment, and a 2-part epoxy coating inside and out to protect your drum storage container from extreme weathering conditions and temperature extremes.